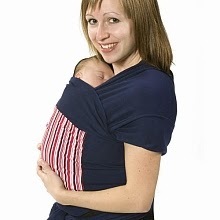 When I was pregnant with my first son I was gifted a Maman Kangarou stretchy wrap. I wore it around the house when my son was very tiny. It worked much like other stretchy wraps I have tried, and felt snug and comfortable for both baby and I. The one neat feature about this stretchy wrap is that it had a pocket on the front. I was scared to use the pocket because it was directly on my newborn's back, and I felt the contents would press on him. The one thing I did not like about this stretchy wrap was the length. It was significantly shorter than others I have tried to date. I am fairly petite and only 5'4, and barely had enough length to tie this wrap. Recommendation: I would recommend a different stretchy wrap, such as a Boba, Happy Wrap, or Moby, before I recommended this, as the length was not ideal. Kindercoat - Three coats in one!